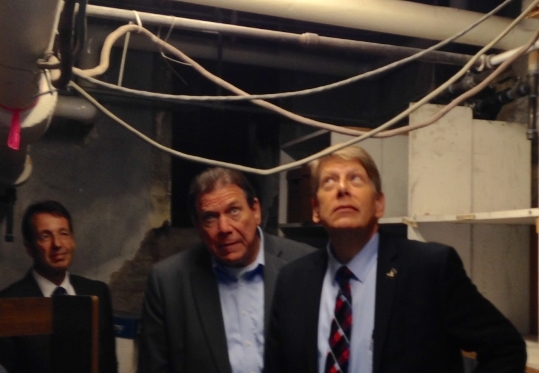 A few years ago, the Office of Legislative Legal Services (OLLS) came to the startling conclusion that we might be the unlucky stars in a disturbing episode of “Hoarders.” We had boxes of files piled up and overflowing the OLLS’ territory in the Capitol sub-basement. We required employees to go downstairs in pairs to ensure no one was lost in an avalanche. What were these files? Where did they come from? And how did we end up with so many? Legislators might not realize it, but every time a legislator asks an attorney in the Office of Legislative Legal Services (OLLS) to draft a bill or write an amendment, the attorney creates a drafting file for that legislator. These drafting files include background documents, research materials, and drafts of bills, resolutions, and amendments, some of which are never introduced. The bulk of the materials in the OLLS drafting files are bill drafts and redrafts, including handwritten notes by the OLLS editors and attorneys about proofreading corrections, word choice, and grammar. In 1993, the Executive Committee (the leadership of the General Assembly) adopted a records retention policy that required the OLLS to keep the legislators’ drafting files indefinitely. In 1993, the General Assembly also amended section 24-72-202 (6.5)(b), C.R.S., of the Colorado Open Records Act (CORA) and section 2-3-505 (2)(b), C.R.S., to define the OLLS drafting files as confidential “work product,” which means the OLLS will not allow a member of the public access to a drafting file unless the legislator on whose behalf the file was created gives express permission. So, starting in 1993, the OLLS asked legislators when they left the General Assembly to sign a form telling us what the OLLS should do if a member of the public asked to see their drafting files. Using the form, legislators could waive the work-product privilege for all of the drafting files created by the OLLS in their name or they could refuse to give permission for members of the public to look at any of their drafting files. Since most legislators did not know what was in their drafting files because they didn’t create the files, legislators often did not know how to respond to the waiver form. Many simply never filled out the form. And the reality was that the OLLS actually never received requests under CORA to see the drafting files. Meanwhile, the drafting files began to accumulate. Due to a lack of space in the Capitol sub-basement where the OLLS stores extra files and due to the conditions in the sub-basement, which are less than ideal (think dust, water leaks, and beetles), the OLLS started transferring older drafting files to State Archives. Recently, we discovered that State Archives had over 1,100 cubic feet of OLLS drafting files, including some dating back to the 1930s. If you stacked those boxes of drafting files end to end, that’s the equivalent of three and a third football fields or almost three and a half times the height of the Colorado State Capitol building! Also, questions began popping up concerning implementation of the records retention policy. For instance, what if a legislator died? Could someone else waive the work-product privilege? What if a former legislator moved and we couldn’t find her? Should the drafting files be preserved as evidence of legislative intent? Did these drafting files have any historical value? Why were we keeping files in perpetuity when they were seldom opened and couldn’t be shared without permission from the legislator? Faced with all of these questions, the OLLS did what any good legislative service agency would do – we asked our legislative oversight committee to do a study! After two years of research and investigation, a committee field trip to the sub-basement to see the dust, bugs, water leaks, and lack of space for the OLLS drafting files, and an examination of their own drafting files, the members of the Committee on Legal Services (COLS) concluded that the drafting files did not need to be kept forever on shelves in the sub-basement or in State Archives. There is minimal long-term historical value to the drafting files. In fact, one legislator quipped that we should destroy the old files in a bonfire à la The Bonfire of the Vanities. Ultimately, the COLS recommended to the Executive Committee that the OLLS drafting files should be kept for eight years and files older than eight years, including those at State Archives, should be destroyed—not by fire but by shredding. The Executive Committee voted unanimously on March 3, 2017, to revise the Retention of Records Policy for Records of the OLLS as recommended by the COLS. Why did the COLS select eight years for the retention time? That’s the approximate amount of room the OLLS has in the sub-basement for storage. The OLLS will handle requests by the public to access an existing drafting file on a case-by-case basis, leaving it up to the legislator to determine whether to waive the work-product privilege. And that…as Paul Harvey used to say on the radio…is the rest of the story. Next Post: Does My Bill Really Enact a Compact?